To achieve a goal, whether it is a higher grade or any technique, you must not stop trying, you must persevere. To show courage, when you and your principles are tested against overwhelming odds. 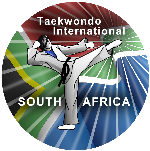 To give all TAE KWON-DO practitioners the opportunity to be educated in the traditions of the philosophical aspects of TAE KWON-DO and the spirit of the Martial art. To give all practitioners, regardless of age, gender or disability the opportunity to compete in their chosen disciplines of TAE KWON-DO.